This is already the third week for me in EMC. And what I have done is mostly learning, learning and learning. I have to say, I did not expected that there are so many new things for me to learn in the enterprise sales team in EMC Germany: the solution and product portforlio including more than 300 products and solutions, the sales methods, tools, strategy and soft skills training, the stakeholders responsiblity in the whole sales process and also a huge amount of competitors information. And it is also the first pure German-team to work. So I have to speak German the whole day, which is quite challenging for a foreigner. Of course I also helped with roll out work for customer meetings and partner meetings. I was really lucky to have had the chance to take part in the Q1&Q2 updates meeting inside EMC and Partner already on the second working day. That is a great chance to have a overall glance of team strategy, status and also all the collegues. Every week I also take part in the update phone call with enterprise account executives together to follow up with the newest information. I have to say, the practical experience really changed my images about sales person before. Sales is not about promoting products to customers or manipulating the customers. It is about helping customers to find the best solution with the most suitable products to solve their problems. Expecially in enterprise sales area, the longterm coorporation with customers and partners is very important. Sales person should understand the technical background information, otherwise they cannot understand the problems from the customers. They have to be reliable, communicative, passionate and also have strategic thinkings to analyse customers and competitors situation. That is really exciting right? I developed a self-learning map for every week to show my progress. And I will keep on updating my progress here too. Next week I will write something about people around me, my mentors, managers, landlord and friends here. Wish you and myself a happy easter holiday! Paris is calling! Hi, my name is Xiaojing and I am from China. In this blog I would like to share my stories during my internship in EMC Corporation sales team in Frankfurt from April to June. Time goes so quick and my internship already starts today! I still cannot believe that I made the quick decision in two weeks, packed all my stuff and moved to Frankfurt at the end of March. And today I just settle down in the new city and start my new journey! Yeahhh. Something about myself: I did my bachelor about German economics and politics in China for four years. And then I came to Germany to do my master in culture and media theorie. At the same time I did part-time job in SAP Germany for more than one year and just finished my master at the end of January 2014. I come to EMC through blind applying. At the end of last year I heard this programm from one of my friends. The most important is, all the companies in this programm are very famous international companies. I found this idea interesting and challenging. So I applied online with my CV and answered several questions about my personality and career plan. Maybe Blind Applying team used some big data analysis software to help them find the matching candidates. When I got the news that I was selected to this programm and had the first talk with the HR via telephone, I surprisingly found out EMC is exactly doing the business what I have thought about for a long time. It turned out Blind Applying to be really BLIND like a blind DATING, in a successfull way. On the first day I got my new laptop, introduced myself and talked about my task with my mentors. I felt not nervous at all because we talk like good friends already on the first working day. I am so looking forward to more challenges in my internship. 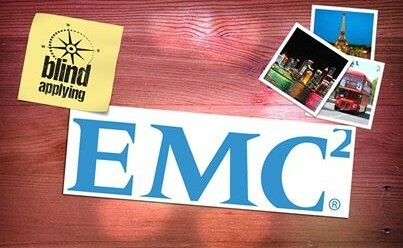 And in this blog I will keep you uptodate, telling you more about EMC, myself and the blind “Date” program.